Is there a keyboard shortcut to select the entire current line in Notepad++? 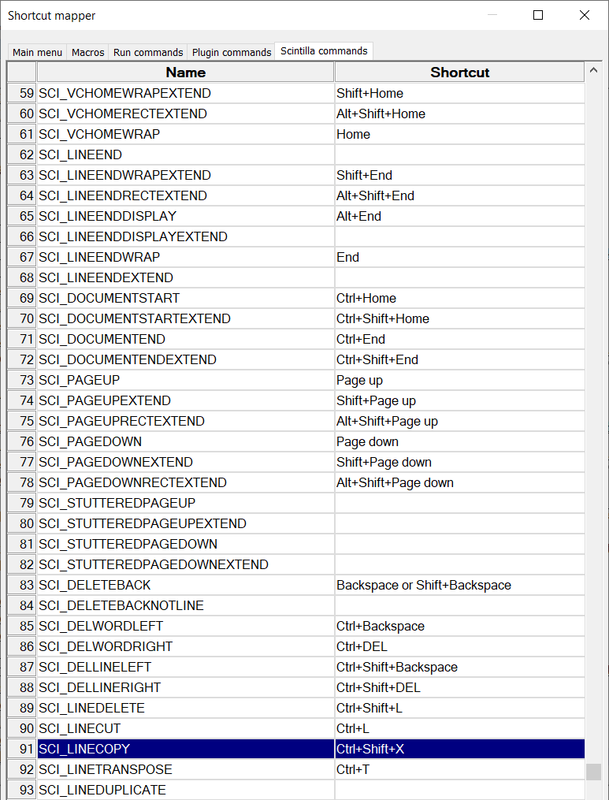 Microsoft OneNote has a handy shortcut (Ctrl+A) that I use all the time to select an entire line. And if you click it a second time it selects the entire document. I really would like to use Ctrl+A as shortcut in Notepad++ to select the current line, but its default is to select the entire document. Is there a way to make it select only the entire current line? End then Shift+Home can also be used. If you need to select the line from the very beginning instead of the first indented character, press Home twice. There are also other actions without default shortcuts like line transpose, line join, line duplicate... Just select Settings > Shortcut mapper > Scintilla commands, select SCI_LINETRANSPOSE / SCI_LINEDUPLICATE / SCI_LINESJOIN... and assign them. If you're using a mouse, single click the line number on the left or triple click in the line also do the trick. For those for whom the accepted answer doesn't work: I just answered a similar concern in the Notepad++ Community. Basically, there are two commands associated with Ctrl+Shift+T shortcut simultaneously, and the other appears to be taking preference. If you would prefer Ctrl+Shift+T to reference SCI_LINECOPY, find the conflicting command (for example, Shortcut Mapper >> Main menu >> Restore Recent Closed File, which is what's causing the conflict in my copy of NPP), select Modify, then change the dropdown letter from T to NONE and hit OK. Assuming there are no more conflicts, the shortcut will revert to SCI_LINECOPY. I think you can make it via Macro. Hold Shift and tap Down ↓ to mark for example 10 lines . And delete them. Go to Macro > Stop Recording. Now your macro is recorded, you can save it for using in the future . Go to Macro > Save Current Recording Macro... . And save it with a name . Move cursor to line that you want to delete lines after that.Then go to Macro > Run A Macro Multiple Times... . And select your macro and run it N times that you want. Shift + End -- selects the entire line after the cursor. Not the answer you're looking for? Browse other questions tagged keyboard-shortcuts notepad++ microsoft-onenote or ask your own question. How do I copy a whole line in Notepad++ without selecting it before with a shortcut? Why doesn't Ctrl+F4 work in Notepad++? How do I make Notepad++ delete lines like Eclipse does? How can I select everything between tags in Notepad++?